Photkina 2010: A report in pictures « efix:photography – News. Thoughts. Pictures. 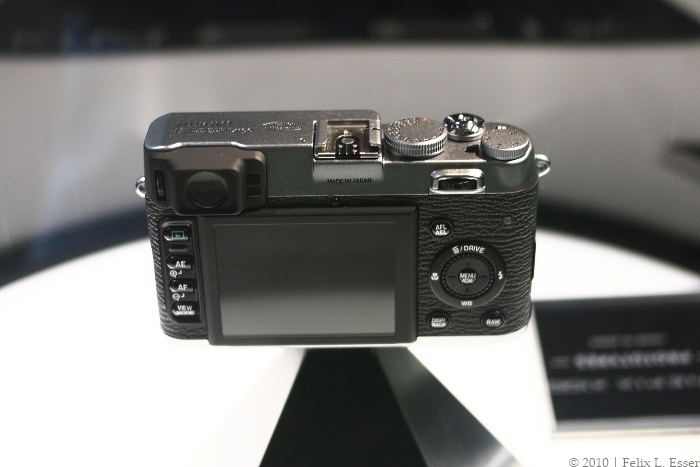 The greatest announcement at Photokina this year was surely the Fujifilm X100 — a rangefinder-like hybrid camera, featuring a fast f/2 35mm-equivalent lens, all manual controls, a metal body and an optical viewfinder into which information from a semi-translucent, high-resolving LCD can be projected. 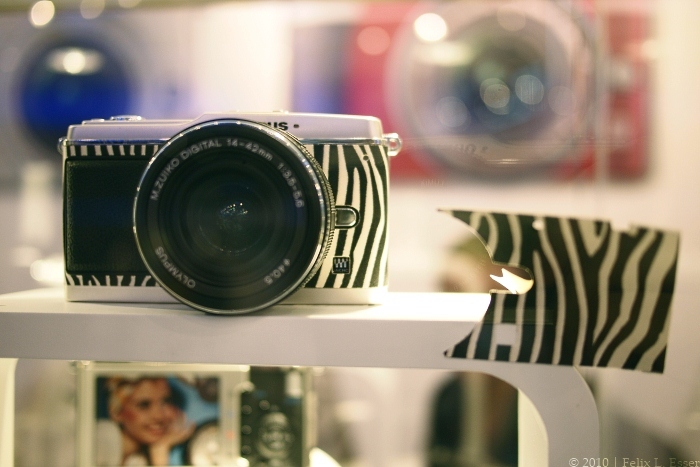 The stunning, beautiful, fantasic, revolutionary, loved-by-all, photokina highlight Fujifilm X100 prototype. 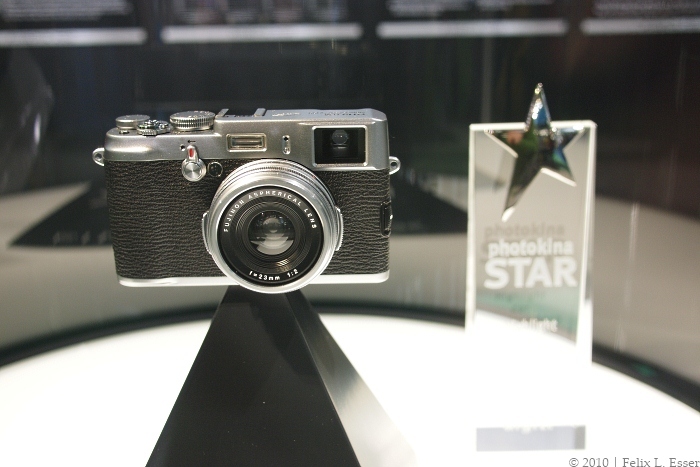 Look: it’s even got the “photokina STAR” award! I honestly believe this was one of the biggest announcements, stirring up the whole photographic community. And isn’t it looking just great! 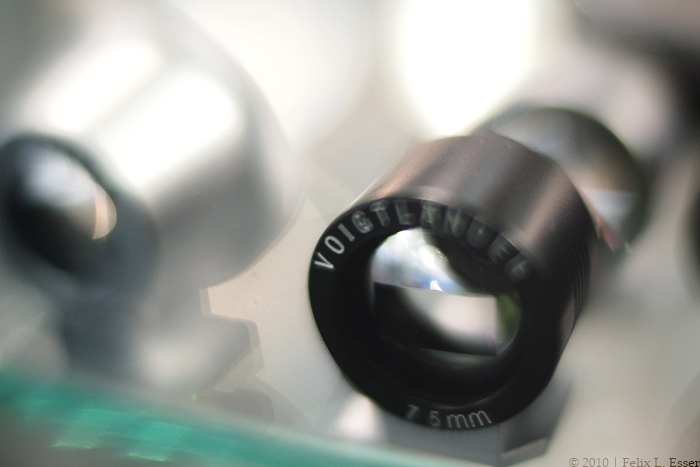 The lever top-left of the lens is not for the self-timer, but to switch between optical viewfinder with projected info and electronic-only image, for which the OVF is darkened. The lens has a dedicated aperture ring with an additional ‘A’ position for shutter-priority and automatic modes. The backside of the X100. Top-left: The large and bright viewfinder, with a diopter adjustment wheel to the left and a sensor detecting your approach to the right. Top-right, from left to right: adjustment wheel for shutter speed, also with an ‘A’ position, traditional shutter button and adjustment wheel for exposure correction. 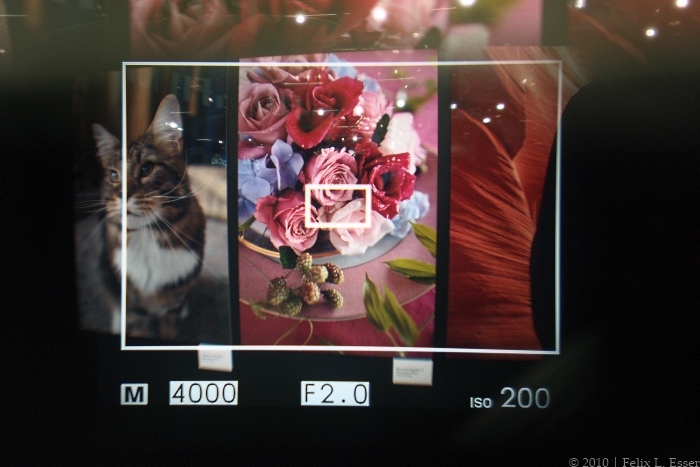 A look through the X100's viewfinder in optical mode with projected information. 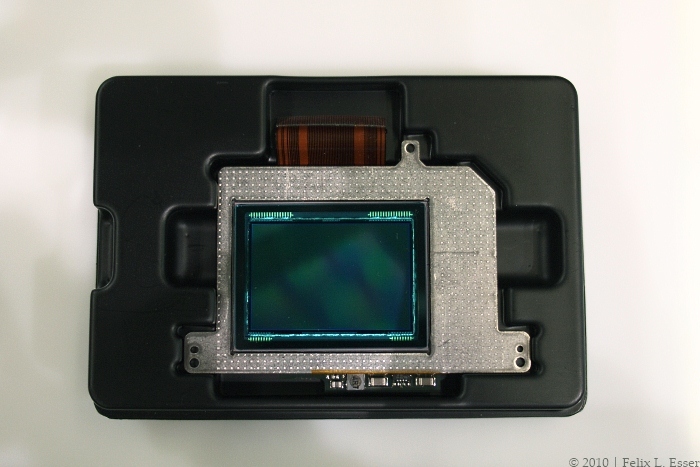 A disected Fujifilm W3 3D camera. You can see the two lens+sensor modules in the middle of the front row. The chinese manufacturer best known for their camera accessories and Tokina branded lenses had a prototype of their upcoming C-mount ILC on display (so it did not get lost, in fact). As reported earlier, it’s going to feature a 1/2.33″, 14 megapixel sensor, and will come with a 6mm f/1.4 lens in February 2011. I think I’ll get one if funds allow so. 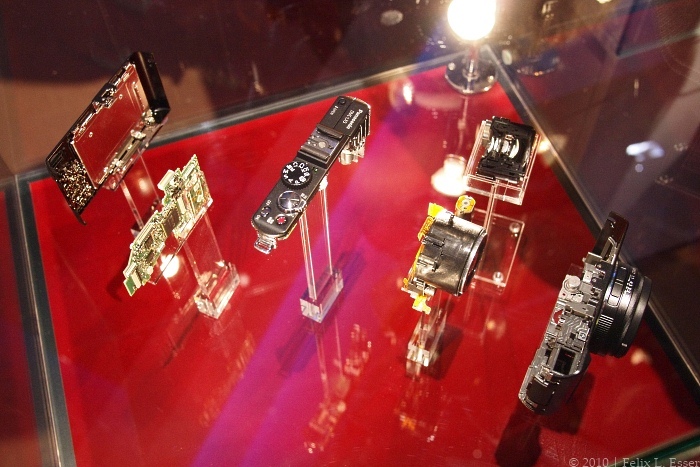 The upcoming C-mount ILC from Kenko. 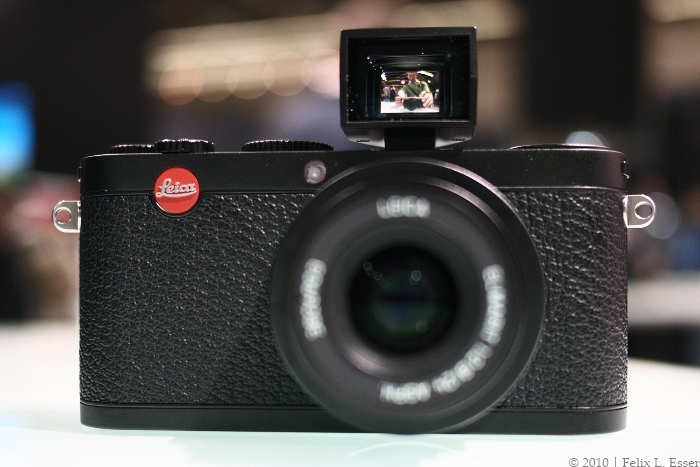 There we are, Leica. As you know, I’m a big fan of anything featuring the famous red dot, so I was of course excited to visit the Leica stand. 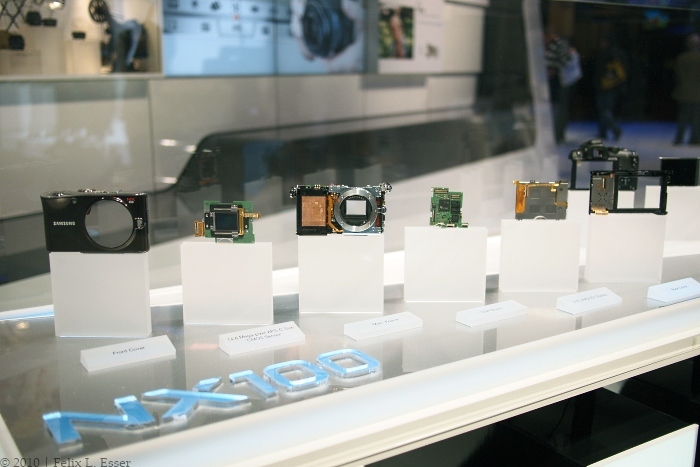 I knew there wasn’t much to be expected, as the M9 Ti, the black X1 and the new re-badged Panasonic compacts had already been anounced last monday. But nonetheless, I did of course have a look at everything! 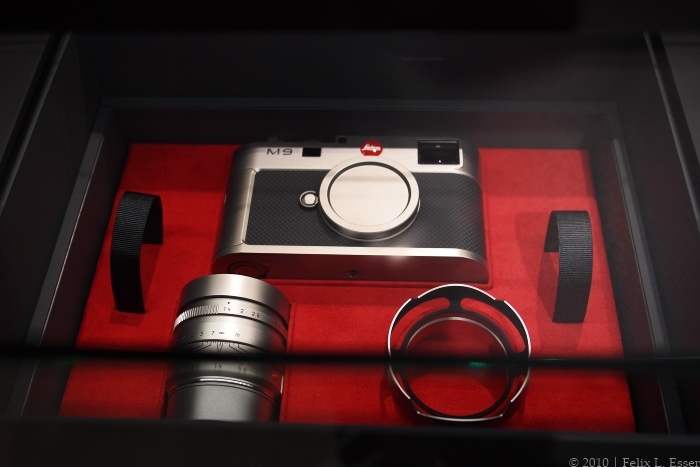 The M9 Ti in its cosy box, together with the special titanium 35/1.4 Summilux and other accessories. 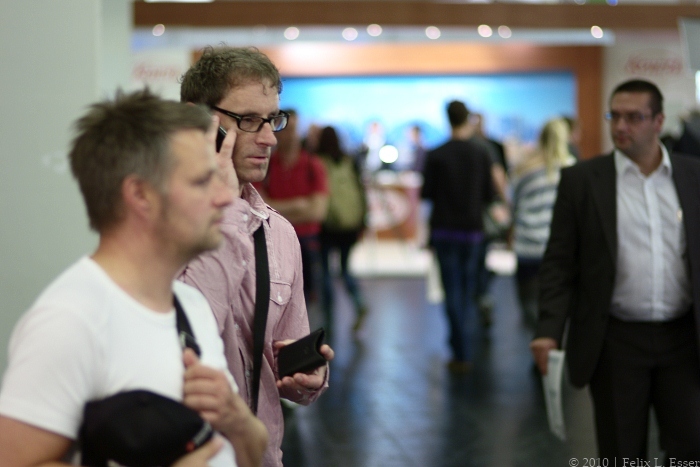 This gentleman was so nice as to let me try the 50/0.95 Noctilux-M on my M8, and to my surprise focusing was spot on! 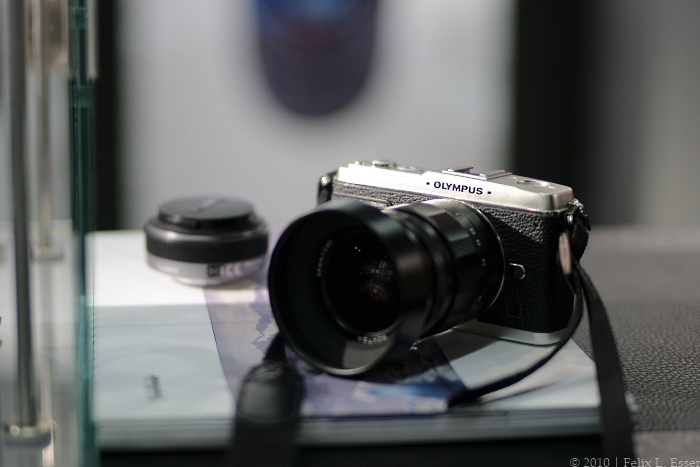 Trying the Noctilux-M 50mm f/0.95 on my M8 - forgot to turn lens detection on, though. I could also put my hands on an M9, and boy, what a joy! So much nicer than the M8. Looks more solid, feels more solid. The framelines look right. The shutter is much quieter. I can really understand the fuss about it now. The X1’s focusing is still as sluggish. Terrible! 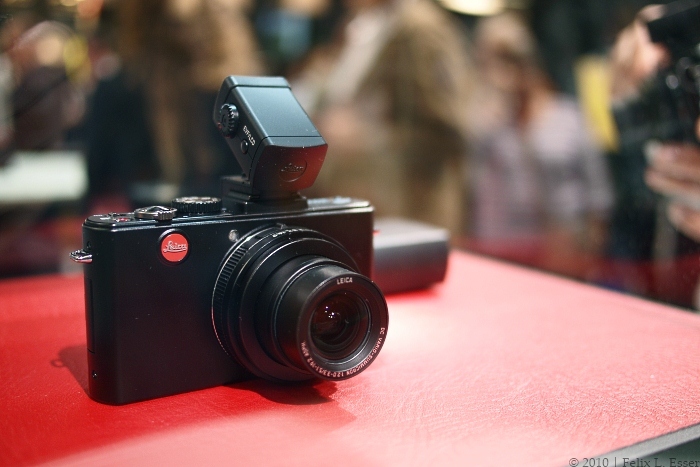 But the gentleman at the X1 showcase told me that Leica were currently working on a new firmware which could possibly contain routines for faster AF. But as we know from Olympus, in the end it’s the AF mechanism in the lens that is the ultimate bottleneck … (And judging by the noise the X1’s lens makes during focusing, I guess this is in fact the bottleneck.) Also no word on a possible X2. 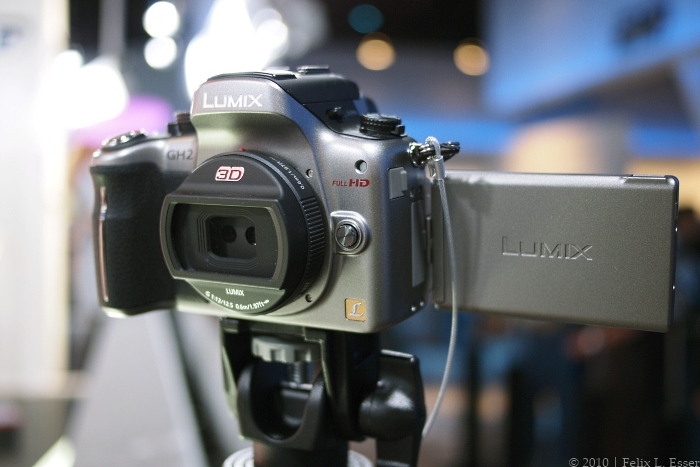 The new D-Lux 5 (essentially a Panasonic LX5 with Leica design and firmware), fitted with the viewfinder known from the GF1. 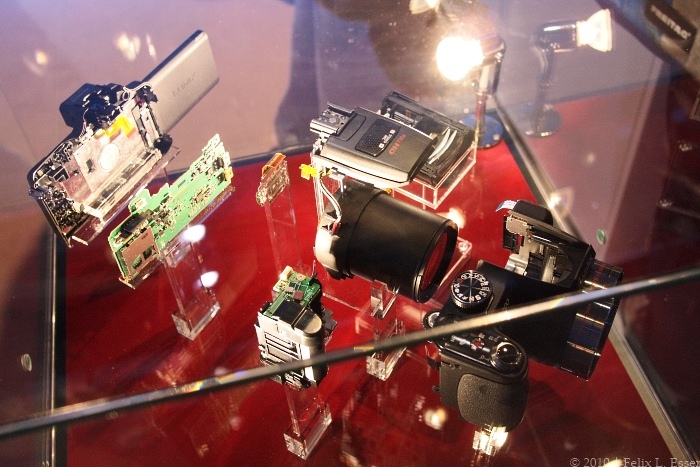 The Leica S system showcase. 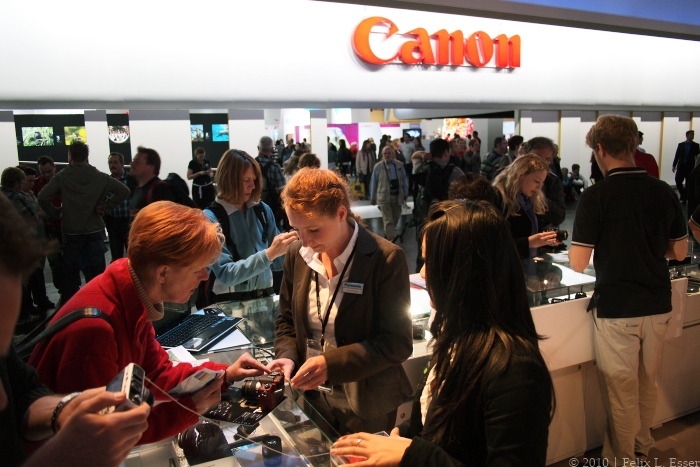 Copy the text from Canon above, exchange ‘Canon’ with ‘Nikon’, and you’ll get an accurate description. 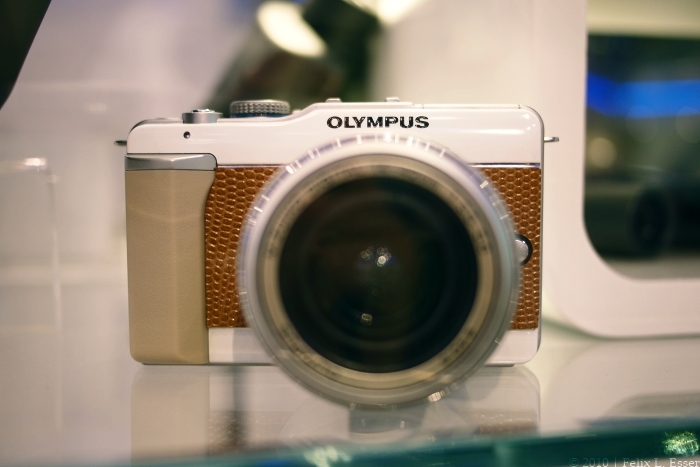 The new M.Zuiko 9-18/4-5.6 on the Olympus E-P1. Now that’s perspective! I’m contemplating adding this lens to my setup. Dark red crocodile leather. Well, not real crocodile of course. The white E-PL1 wearing light brown snake skin. Doesn't it look just fabulous!? And the E-P1 in dark red snake skin. What a beauty! The Voigtländer Nokton 25/0.95 for Micro Four Thirds!!! The new 40-150 tele zoom, by the way, is exactly the size and shape of the 14-150 superzoom! 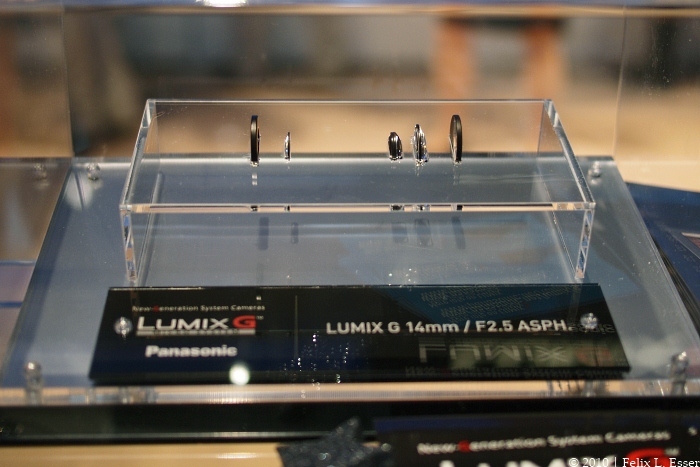 At the Panasonic stand, the latest addition to their G system lineup were presented, as well as the latest compacts, such as the LX5 and the FZ100. They also had the new 14/2.5 pancake and the 100-300mm super tele zoom. 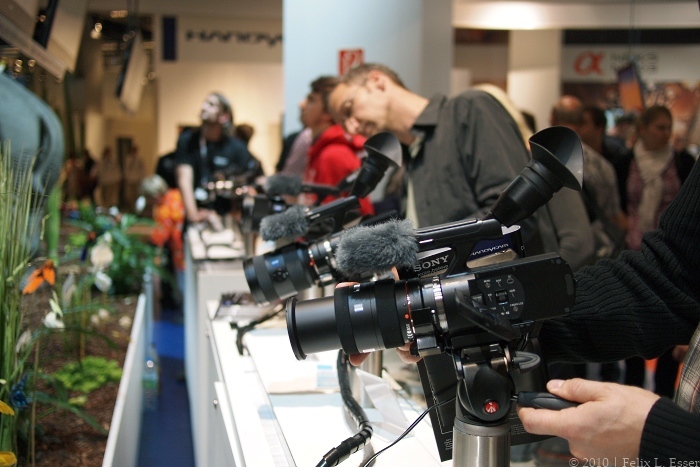 Another huge feature were their latest 3D products, in TVs as well as in camcorders and digital cameras – yes, they had the new 3D lens, and you could even try it out on a GH2! But let’s have a look at their stand one item at a time. The new 14mm f/2.5 pancake (right), next to the 20mm f/1.7 pancake. It really is tiny! A quick snap with the new 14/2.5. Not my focal lenght, but a nice little lens with much quicker focus than its bigger sibling. The 14/2.5's optical architecture. Much more condensed in reality, of course. For comparison: the optical architecture of the 100-300mm super tele zoom. One word: massive! 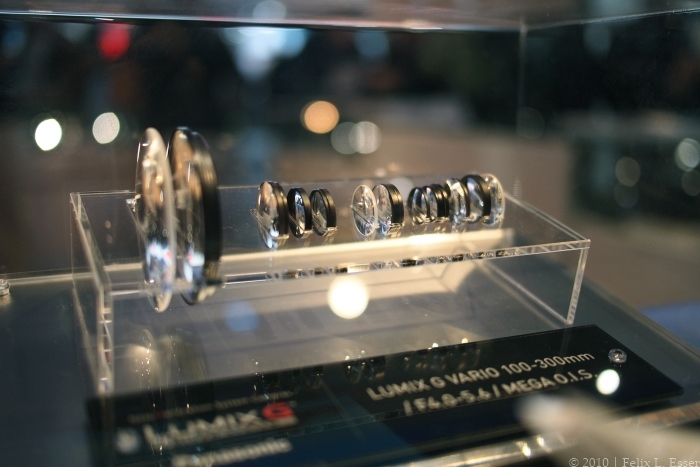 The new 12.5mm f/12 3D lens for Micro Four Thirds on the equally new GH2. There was no way to see the 3D effect, though. 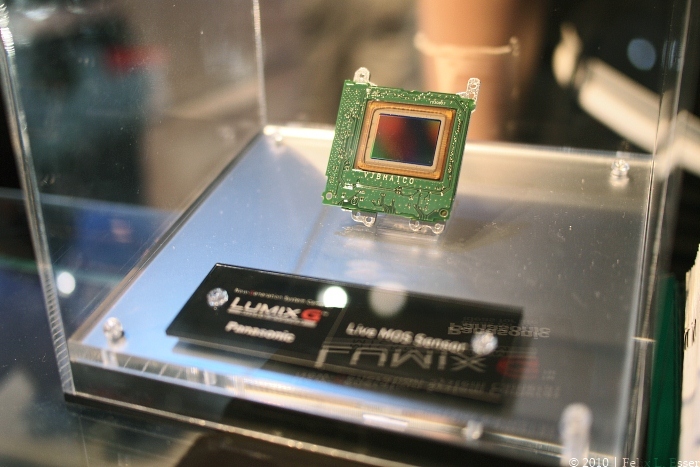 The GH2's new 18 mp sensor. As you can see, it's in 3:2 format to accomodate for the multi-aspect-ratio feature of the GH series. 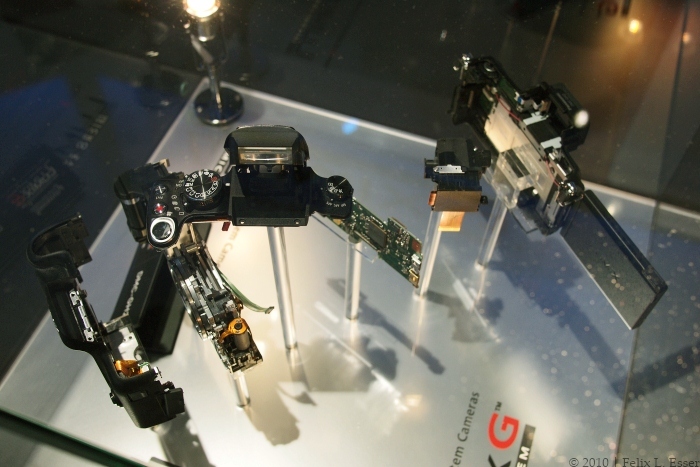 A disected FZ100 superzoom bridge camera. And another disected camera. This time, it's the new LX5. 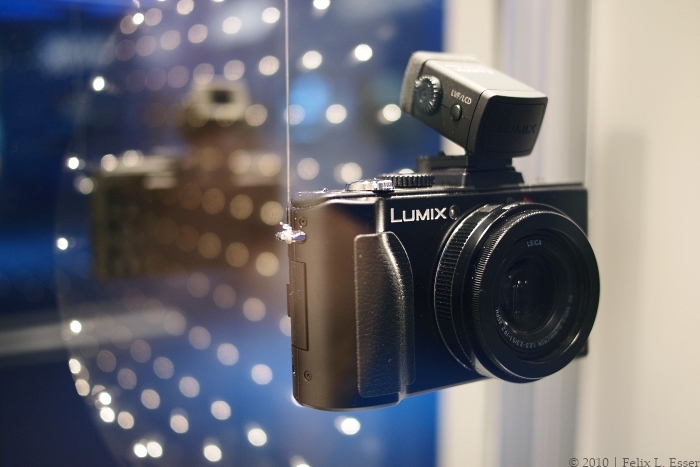 The new Panasonic LX5 + viewfinder. Compare this to the picture of the Leica D-Lux 5 above. 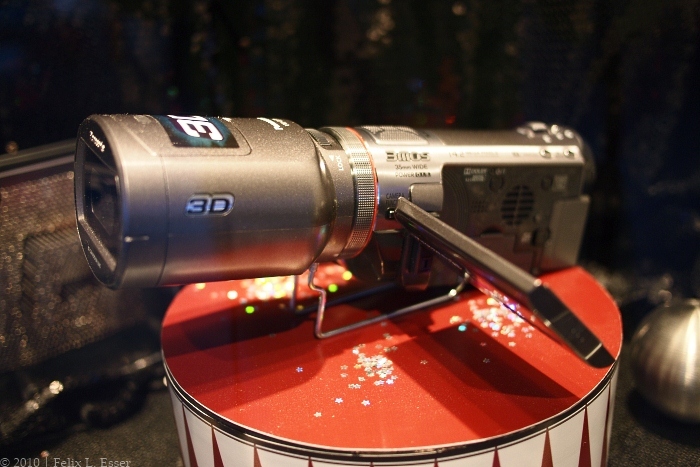 A current Panasonic camcorder model with 3D lens. 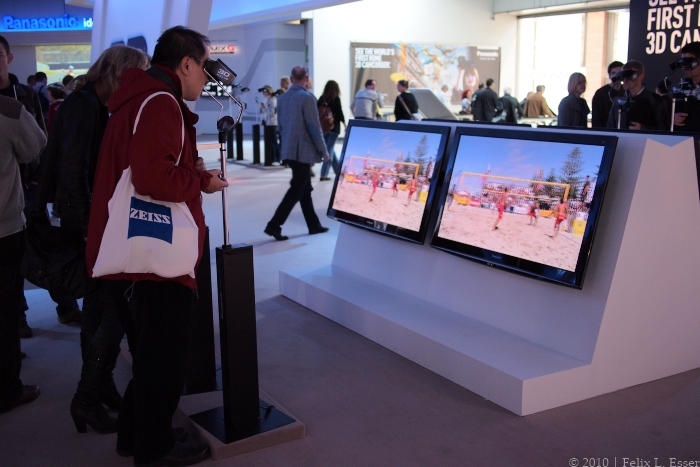 Panasonic's latest 3D televisions, ready with 3D goggles to try out the effect. Playing it big: the world's largest (152") 3D capable plasma TV. 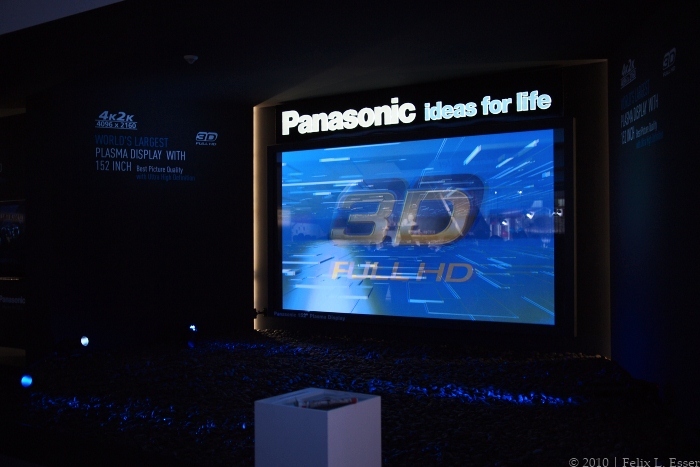 To be honest, I found the fuss Panasonic made about their 3D products to be highly over the top. Personally, I wasn’t convinced by the 3D effect even on that huge 152″ screen. But maybe it’s just not my thing. Did you know these 6×6 TLR’s were actually still made? I didn’t! And there are actually three models: a 50mm f/4 wide-angle, an 80mm f/2.8 normal and a 135mm f/4 tele. Nice! 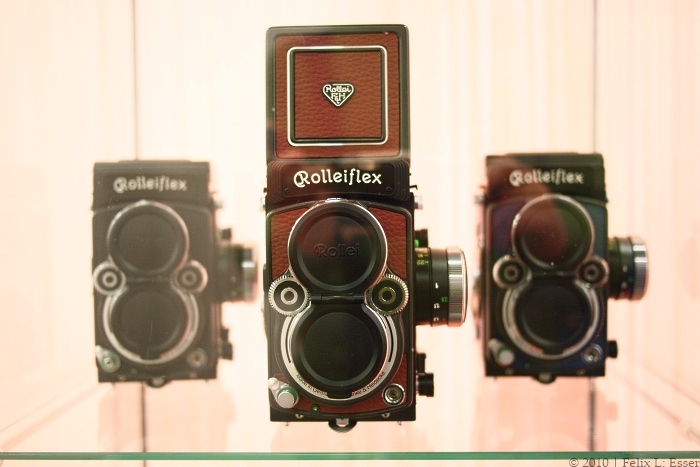 Rollei's three TLR models, with customized body coverings. They run on 120 medium-format film, btw. 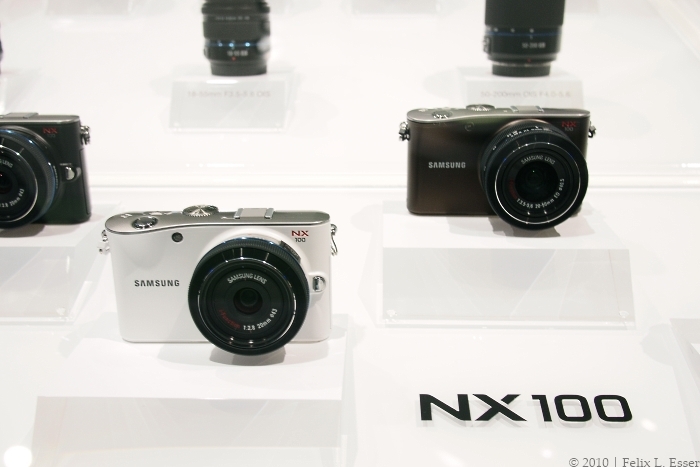 Samsung’s highlight at the Photokina was of course the NX series, and chief among it the NX100. All has been announced already, so not much to report on. 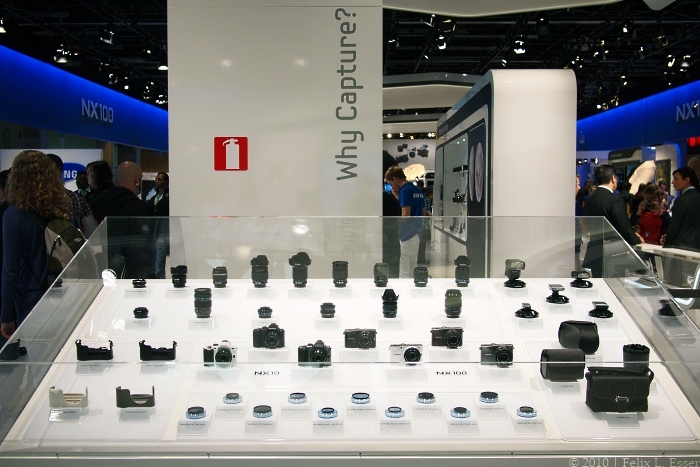 Samsung's complete NX lineup, including cameras, lenses and accessories. The new NX100, together with the two new NX lenses, the 20-50mm collapsible "i-Function" zoom, and the 20mm f/2.8 "i-Function" pancake. The biggest announcement from Sigma was probably the SD1, their new flagship DSLR, featuring a completely new, high-resolving, APS-C sized Foveon sensor. 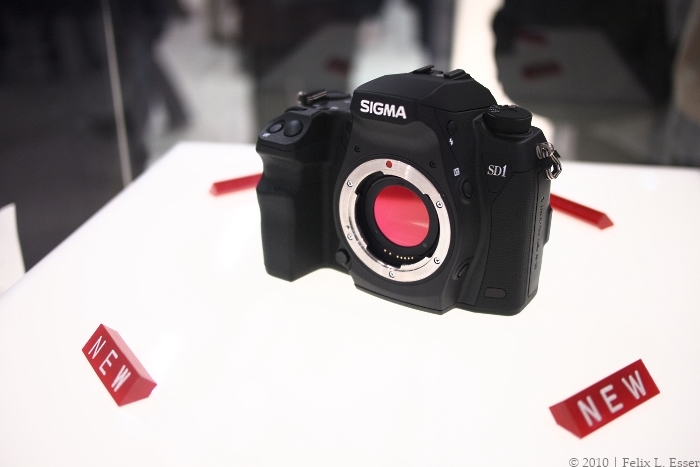 The new SD1 APS-C Foveon DSLR at the Sigma stand. Pimped-up NEX cameras. 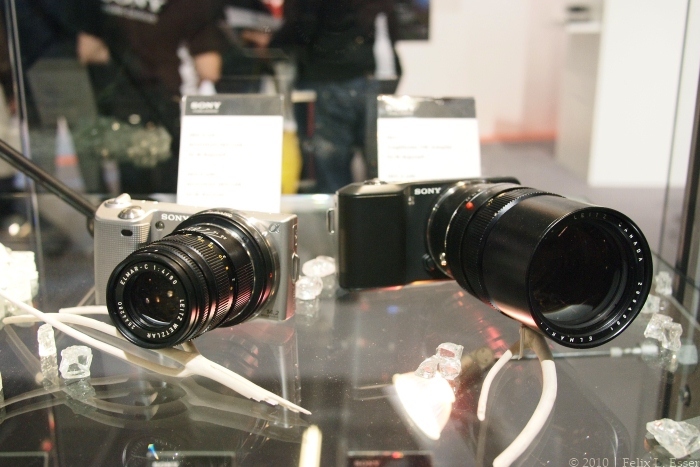 Left: featuring a Leica 90/4 Elmar-C. Right: featuring a 90/2.8 Elmarit-M. 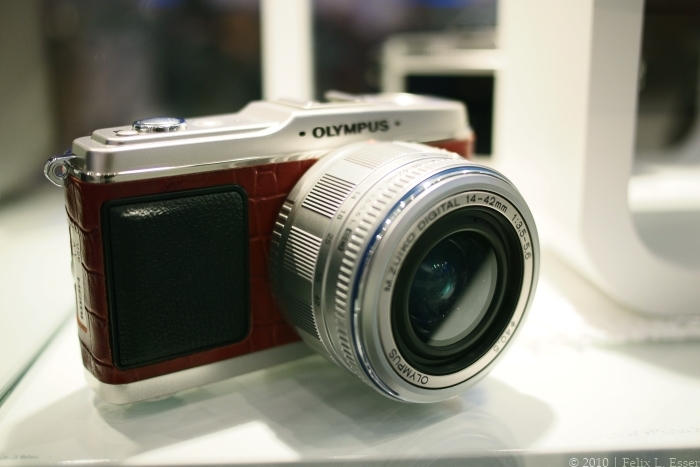 They had even more pimped-up NEXs in that showcase, including one with an Olympus OM lens attached! 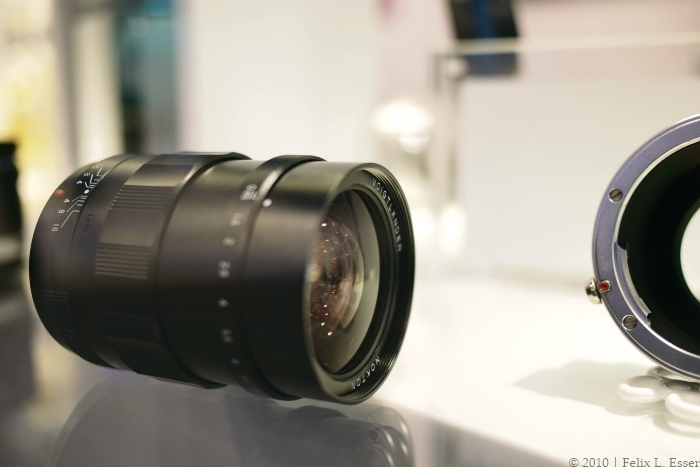 Upcoming Sony E-mount lenses, part 1. 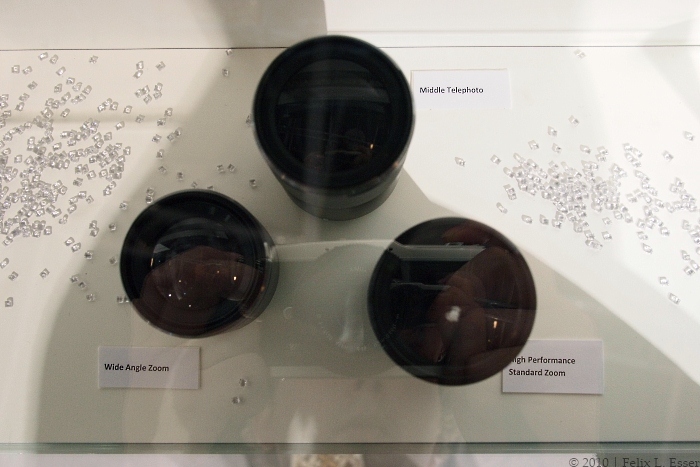 Upcoming Sony E-mount lenses, part 2. The “Wide-Angle, Fixed Focal Length and “High Performance Standard Zoom” sound especially interesting! 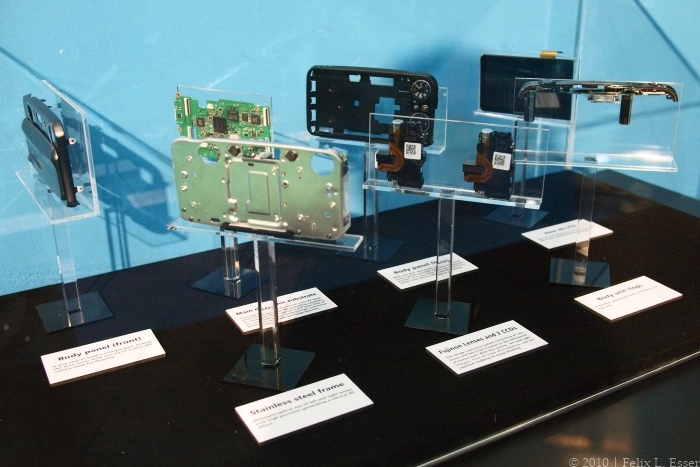 Sony A- and E-mount camcorders on display. Voigtländer’s was the other stand I couldn’t wait to visit, as I was keen on trying out both the new 25/0.95 MFT lens, as well as the new 75/2.8 Heliar Classic for M-mount. 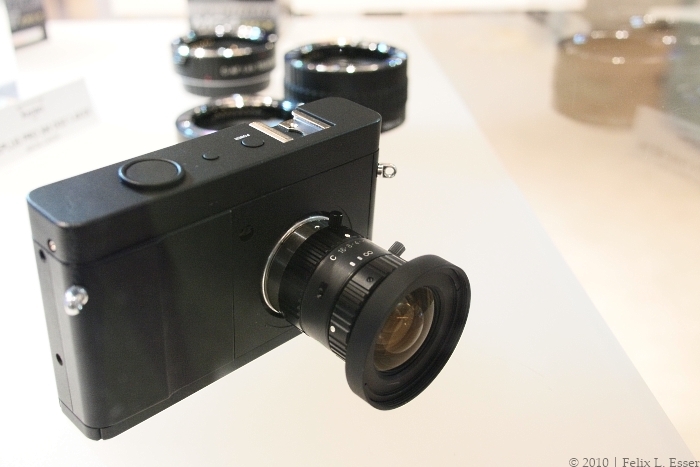 Apart from those two highlights, the complete Bessa camera and lens lineup was showcased. The new Voigtländer 25/0.95 on my E-P1. Close-focusing the Voigtländer 25/0.95 @ f/0.95. 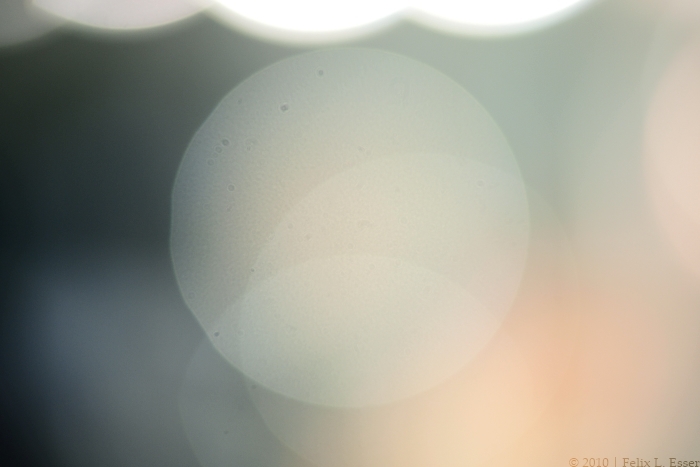 Bokeh test with the new Voigtländer 25/0.95 for Micro Four Thirds. Nice! I now sooo want this lens …! I also put my hands on the new 75mm f/1.8 Heliar Classic, Cosina’s new Voigtländer branded portrait lens for M-mount. Its body design is very similar to that of the 25/0.95 shown above, and the lady at the stand told me this design was also to be expected for future Voigtländer lenses. 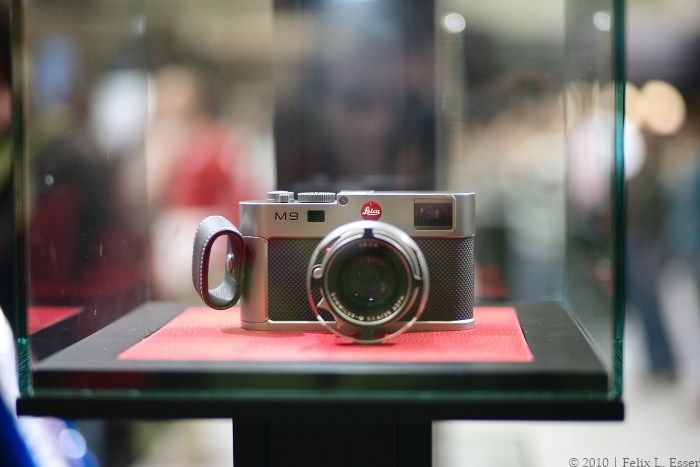 The new Voigtländer Heliar Classic 75/1.8, tested on the Leica M8. The picture isn’t tack-sharp, but focus was spot on, and I think you can already see it’s got a nice rendering and is a viable alternative to Leica’s 75mm lenses. On my inquiry if the 50/1.5 Nokton was eventually going to be reintroduced in M-mount, the lady at the Voigtländer stand replied that this was not currently planned. 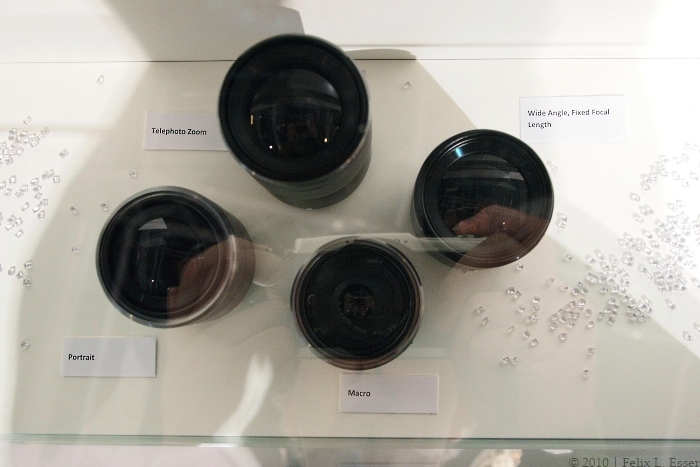 Not much to see here, as Zeiss didn’t announce anything new for Leica. 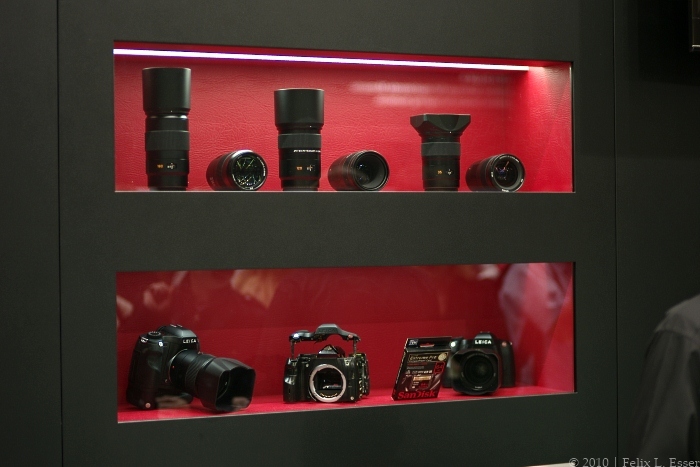 But of course their complete Ikon camera and lens lineup was showcased, as well as their DSLR and cinema lenses. 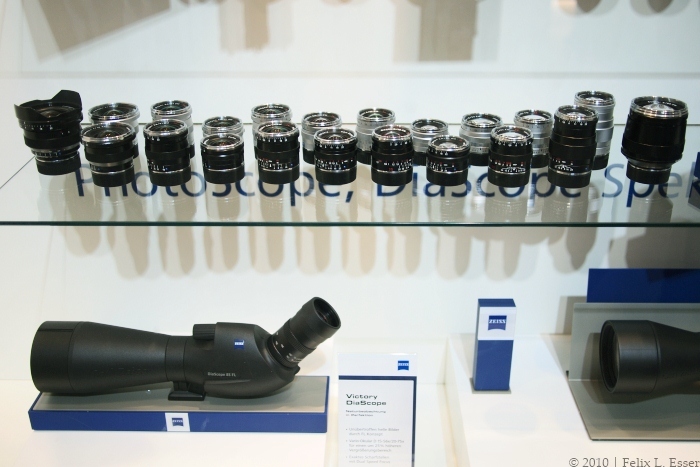 Zeiss' complete M-mount lens lineup, from the 15mm f/4 to the 85mm f/2. 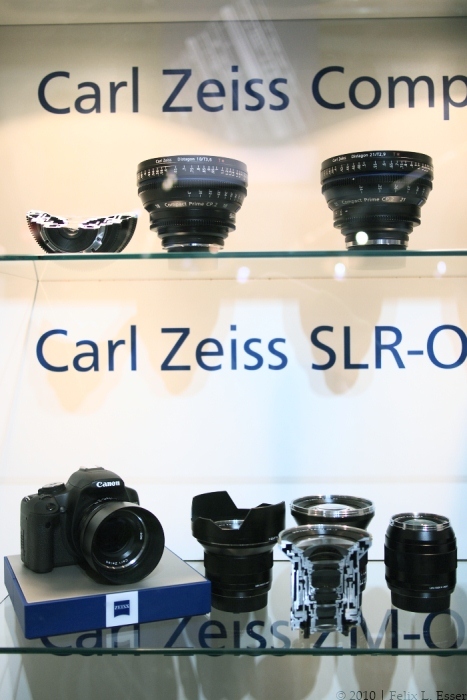 The Zeiss CP.2 cinema lenses in size-comparison with a Canon EOS 550D DSLR. I could also try out a Zeiss Ikon rangefinder camera, and I have to say those are really nice! 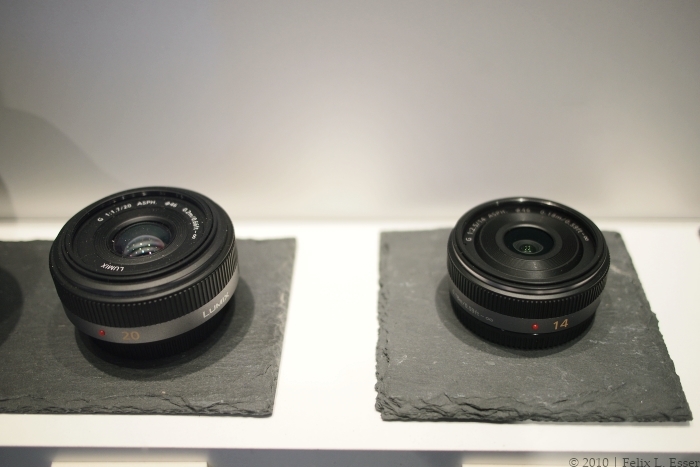 The viewfinder is much larger as Leica’s, so you can actually use a 28mm lens on the Ikon without compromise. 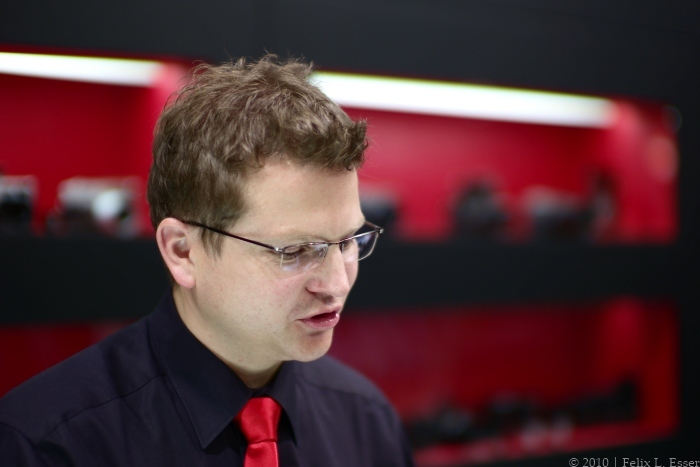 My impression was, though, that Leica’s framelines are brighter and easier to see. 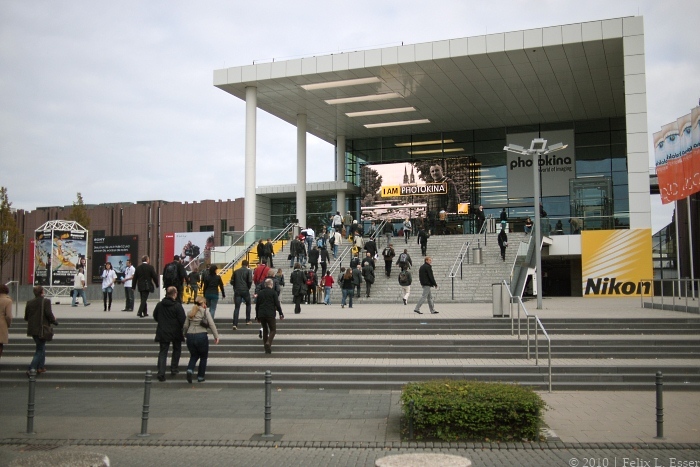 This concludes my brand-specific report on this year’s Photokina in Cologne, Germany. There was of course much much more to see, but I only had one day, and to see the whole fair you need at least two days — and that’s only visiting each stand for a few minutes! To have a closer look at everything, you would’ve needed the whole week, probably. It was that huge. 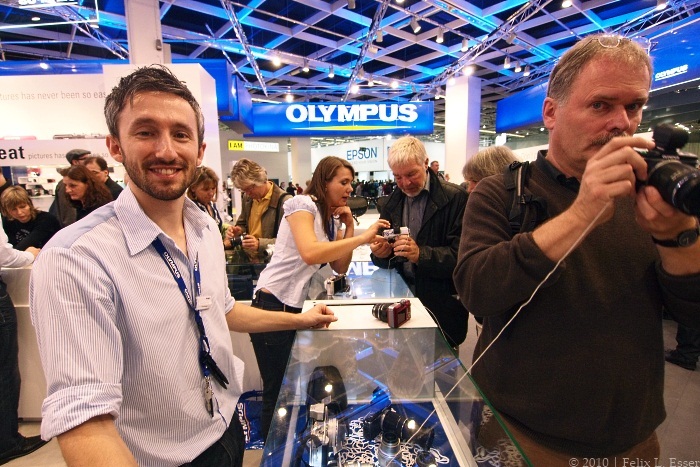 And it set a new record: more than 180,000 visitors! It was an exciting experience, and I hope to be able to visit it again next time. 1. Is the aperture ring step-less(continues) or is it step by step? I have Canon FD 50mm 1.4 and aperture is step by step and every time I change it, my camera shakes. Really annoying when filming a video. 2. 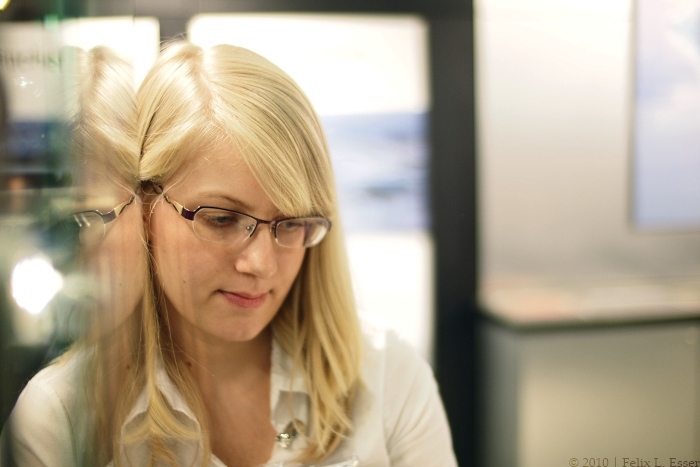 Is the Manual focus assist(Panasonic GH1) automatically triggered when focus is used? 1. If I remember correctly (I only had the lens for a few minutes), the aperture ring has half-stop clicks, as with most Voigtländer lenses. If you’re looking for a lens with stepless aperture ring, you might want to look into C-mount lenses (although these won’t cover the whole sensor area of your GH1). 2. 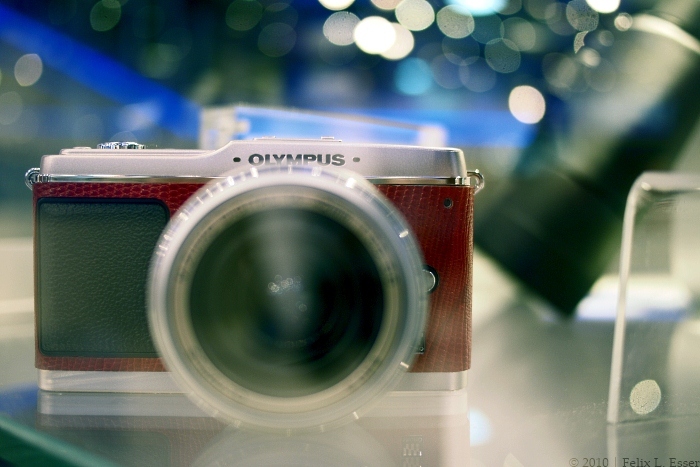 I’m using an Olympus E-P1, so I cannot speak for the Panasonic models. On my E-P1, I had to dial in focus magnification by hand. I believe it would be the same as with your GH1 + Canon 50/1.4 lens, as the Voigtländer 25/0.95 doesn’t feature any electronic contacts – it’s a completely mechanical lens. I hope this helps you, and thanks for reading my blog!